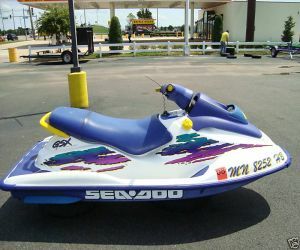 This is a 1996 Seadoo GSX Bombardier Waverunner Jetski. It looks great and runs just as well. It has good compression. The hours of use on this one are unknown. This unit does not come with a trailer. This 1996 Seadoo GSX Bombardier is in real good condition. There are no crack or leaks. There is no known exterior damage. The paint job on this Seadoo is very flashy and has been well maintained.